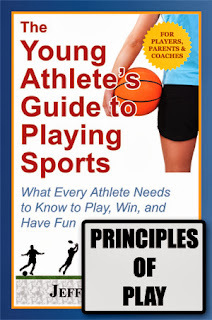 Here's Part 2 of the Advantage/Disadvantage topic from my new book, The Young Athlete's Guide to Playing Sports. In team sports such as hockey, basketball, lacrosse, and soccer, there are often two-on-one and three-on-two situations. What do you do when you’re outnumbered? For example, what do you do when you’re the defensive “one” on a two-on-one fast break by your opponents toward your goal? Depending on your sport, there are several tactics you can use. In hockey, where a goalie is defending the net, you ultimately need to defend the pass to the opposite player, leaving your goalie to handle the shot from the player driving toward the goal. In basketball, you would drop back toward the basket (playing a one man zone) and possibly feint the player with the ball, induce a poor pass, and maybe intercept it. Notice that your responsibilities and tactics defending a 2-on-1 depend on your sport and other factors such as whether a goalie is present. But even with their differences, each sport shares similar tactics in certain situations. In the hockey example above, the defender would initially try to slow down the break farther from the goal should the opportunity present itself. Most sports share a similar objective in situations like this—to induce a bad pass or force a few extra passes to enable teammates to get back and eliminate the numbers mismatch. There are also specific tactics to employ when you’re on offense, depending on whether you or your opponent holds the odd-man advantage. Should you enjoy the two-on-one advantage just described, you can aggressively drive toward the defender. This can open up a pass to your teammate should the defender commit to stopping you. In the opposite situation where you’re outnumbered (such as when facing a defensive double-team), you can make a well-timed pass to a teammate to neutralize the pressure. Offensive advantage is often gained by quick transitions. These can result from either player or ball (puck) movement. Upon a change in possession, a team can often gain an advantage by executing a break toward the opponent’s goal. Should the defense not immediately react, the offense will enjoy a 2-on-1, 3-on-2, or similar odd-man advantage. In team sports with goals, look to the weak (opposite) side for easy scoring opportunities. Players who receive a pass from you will often have an open shot. In non-breakaway situations (e.g., half-court offense), quick ball movement can result in open scoring opportunities on the weak side. This is most evident against zone defenses. Offensive players can reverse/swing the ball from one side to another through a series of passes or a skip pass. Because the zone cannot transition fast enough to the opposite side, open space exists for a player to receive a pass and possibly score. Scoring opportunities in individual sports also arise out of quick transitions. As shown in the above tennis example, the winner comes when the ball is finally hit to the open area away from the prior shots. I think practicing these off 2-on-1 situations is a great drill. You want your players to know how to act if they are on the underdog side so they don't panic or let the nerves get the best of them. And knowing how to take advantage of a 2-on-1 play gives your team more confidence that they can push that advantage and score.